The ensemble's next gig (which I'll also be playing on) is on Sunday, May 15th (at around 8 PM, after the Balkans Ensemble) in Schoenberg Hall. 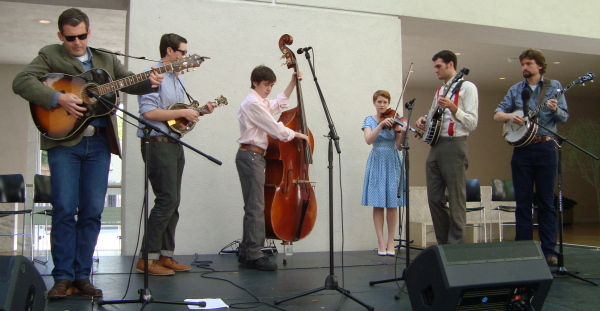 The gig with the 2010-2011 UCLA Bluegrass & Old-Time String Band went swell! Many thanks to all who came out to support! 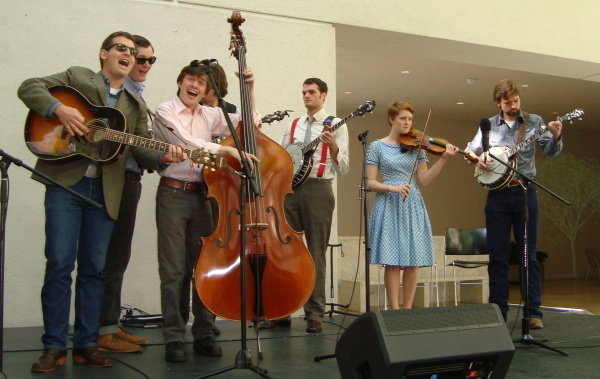 We had an audience of about 50 as we played in the enclosed outdoor area of the Hammer Museum. The set started with a few folk/traditional tunes, like "This Land Is Your Land" (made popular by Woody Guthrie) and "You Are My Flower" (a Carter Family standard). Professor Anthony Seeger was featured in singing on "This Land Is Your Land," while plucking on his long-neck banjo. Doug sang the once-controversial verse about trespassing, and Jennie and Nicolette sang a verse beautifully together in harmony while working the large-diapragm condenser microphone. Wyatt and Joseph also sang a verse in harmony, similar to Doug's. Joseph performed his version of "You Are My Flower," which he has transposed to A Major (they performed it in G Major for a long time). He's told me that he was inspired to bring the piece to the ensemble after he saw Gabe Witcher and Paul Kowert (Punch Brothers) perform it. 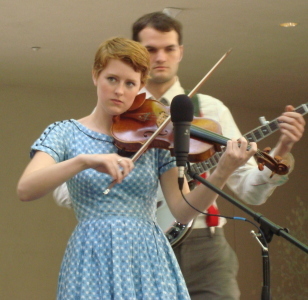 When the ensemble performs it, Nicolette and Rob are featured with fiddle and banjo solos. 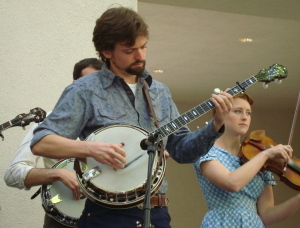 Wyatt performed a bluegrass version of "Blue Days, Dark Nights" (a Buddy Holly blues tune). During the verses, Wyatt would play a standard 1 and 5 bluegrass bass line (eighth notes with eighth note rests), but would then switch to a driving blues bass line (constant eighth notes, double-time feel) at the chorus as Doug and Joseph came in to support him with harmony vocals. Cameron was featured in singing a chilling version of The Grateful Dead's "Rain and Snow," accompanied by Wyatt, who provided a tight harmony vocal while playing guitar and stomping on the stage (...a stage that was meant for stompin' ;). Scott has been elected Ambassador of Old-Time Music for the ensemble. 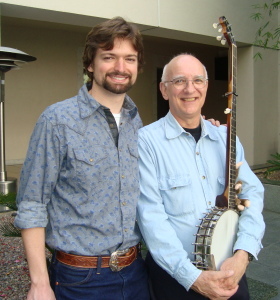 He led the group in several ditties that featured clawhammer banjo playing, fiddles, and verse and chorus singing. My favorite (besides "Elk River Blues") was "Starry Crown," which featured Scott singing the verses and playing the melody on his banjo, along with the fiddles. Wyatt and the boys provided harmony singing during the chorus, which had very interesting melodic phrasing. Scott is a new graduate student in the Ethnomusicology department at UCLA, and we are very happy to have him as the newest member of the ensemble. Then came the best time of all: Tommy-time! :) It's only natural to have Tommy-time after old-time. ;) This was where the bulk of straight-ahead bluegrass music was performed, with a few fun tunes thrown in. "How Mountain Girls Can Love"
Doug and the boys belt out the chorus to "How Mountain Girls Can Love"
We started out Tommy-time with a bluegrass standard: "How Mountain Girls Can Love". I played rolls throughout, only chopping during the guitar and mandolin solos. I was given a solo over the A section chord progression. I made use of 2 standard "upward" bends, followed by a "downward" bend. The "downward" bend idea came from years of listening to Tony Rice's guitar playing. This Bill Monroe tune was straight-up ill. :) My favorite solo is definitely Scott's (so bad*ss), but Rob's solo, half-consisting of harmonics (a lá Mike Seeger), was also very tasteful. Tommy and Rob play in harmony on "Foggy Mountain Breakdown"
Doug picks on "Foggy Mountain Breakdown"
The performance of this piece turned out great; it was the most rewarding version that I've played of it thus far. Rob had an excellent feel for pickin' on this tune, so we decided to try the "harmony banjos" (a lá Roy Clark and Buck Trent) thing toward the end. It was a lot of fun; it was also nice to have a full band with solos all around. Tommy takes a solo on "Cherokee Shuffle"
The tune has been a crowd favorite, and that seems to correlate with my posting of a YouTube video of the 2007-2008 ensemble playing it during practice. When Jennie brought this tune back to the ensemble after I left, they added another vi chord (F#m) to the A section: I like it! :) I tried to take advantage of this extra funk in the chord progression by playing some single-string licks, etc. This was the first time that I performed in public in about two years; it was really good to be back on a stage, sharing my talents. 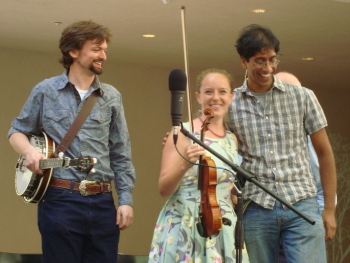 It was an especially good feeling to know that I was on stage with an ensemble that came into existence because of my passion and love for bluegrass music and the American South. I want to express my gratitude toward Professor Anthony Seeger, for supporting my initiative in establishing this ensemble when I presented the idea to him for the 2007-2008 school year. See this article on The Bluegrass Blog for some more history on the creation of the ensemble. I want to especially thank Jennie Gubner for keeping the ensemble alive and well! After I graduated in June of 2008, I was out-of-the picture. Jennie took it upon herself to direct the ensemble, with Professor Seeger's continued support.